Vicente Prieto (Murcia, 1991) is a spanish pianist currently living in Brussels where he is finishing the Master Degree in the Brussels’ Koninklijk Conservatorium with the great professor Boyan Vodenitcharov. He has recently been awarded with international prizes that are giving an impulse to his international career: 1st Prize in the “Clamo Music International Piano Competition” (Spain, 2016), in the “Maria Giubilei International Piano Competition” (Italy, 2015), 2nd Prize in the “Primavera Pianística International Piano Competition” (Belgium, 2016), Special Jury Prize in the “Coimbra World Piano Meeting” (Portugal, 2016). Vicente first studied in Murcia (Spain) with prof. Pilar Valero, who was very important for his education. There he finished the Bachelor Degree obtaining High Distinction and he received an scolarship to participate in the Internationale Sommerakademie (Mozarteum University, Salzburg). 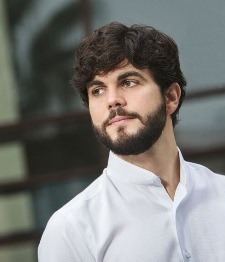 While studying in Spain, he won several piano competitions for young pianists: 2nd Prize in the “Mariana Baches Competition” (2008), 1st Prize and Special Prize Virginia Martínez in the “Villa de Molina Competition” (2010), 1st Prize in the “CPMM Ginés Abellán Competition” (2010), 1st Prize in the “Villa de Molina Competition” (2012). Since 2009, Vicente is following the great pianist Aquiles Delle Vigne’s masterclasses around the world and he attended in 2011 the Schola Cantorum in Paris and the Coimbra Music Academy (Portugal) to be his student. Nowadays, he is still receiving lessons from Delle Vigne and he will always consider him his mentor and master. In 2010, Vicente participated in the recording of a CD with works by F. Chopin and played in a recital that was broadcast live on the national radio of Spain (RNE). 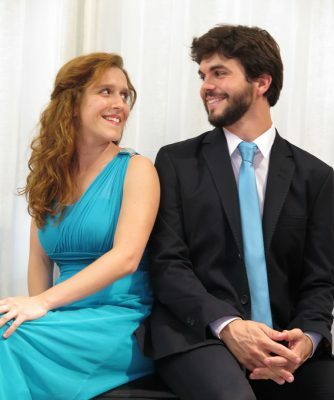 Since 2011 he develops a Piano Duo with Naira Perdu playing 4 hands and 2 pianos repertoire. They have played many recitals and concerts, including Bach 2 Pianos Concerto in C minor BWV 1060 with Elche Symphony Orchestra conducted by Leonardo Martínez, Saint Saëns Carnival of the Animals and Mozart 2 Pianos Concerto in E flat major K.365 both conducted by Virginia Martínez. As Piano Duo, they received in 2016 a scolarship to participated in the Tel-Hai International Piano Festival (Israel), attending masterclasses from Kanazawa-Admony Piano Duo. Vicente has played recitals and concerts in Spain, Portugal, France, Belgium, Germany and Italy; playing also with orchestra as soloist, highlighting his interpretation of Rachmaninov Piano Concerto n.2 with Elche Symphony Orchestra conducted by Leonardo Martínez (April 2013). NAIRA PERDU MOLINA (Almería, 1990) begins her studies in Spain, where she finished her Bachelor Degree in the Conservatory of Murcia with the pianist Pilar Valero Abril, obtaining “High Distinction” in her final recital. During that period, she completed her education attending to the International Piano Festival « Primavera Pianistica » in Belgium (2009-2012), studying with the pianist Imre Rohman at the University of Alcalá de Henares (2011-2012) and receiving masterclasses from great pianists like Fabio Bidini, Claudio Martínez Mehner, Nino Kereledize, among others. Naira has taken part in piano recitals in Spain, France, Belgium, Germany, Italy and Israel and she collaborates as a pianist with the Murcia Symphony Orchestra since 2012. Deep lover of the Chamber Music repertoire, she developed a Piano Duo with the pianist Vicente Prieto and they have played recitals in different countries and they also played concerts with orchestra like Bach Concerto for 2 pianos in C minor BWV 1060 with Elche Symphony Orchestra (October, 2011), Saint-Saëns Carnival of the Animals (March, 2014) Mozart Concerto for 2 pianos K.365 (November, 2015) both with Murcia Symphony Orchestra. Last year, they received a scholarship to attend the International Piano Festival in Tel Hai (Israel) with the Kanazawa-Admony Piano Duo. Last February 2017 they played in a “world premiere” choreography from Ivan Vassiliev, playing for the first dancers from the Bolshoi theater of Moscow. 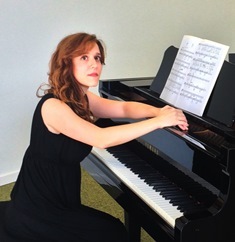 At the present days, Naira is finishing her Master Degree at the Royal Conservatory of Brussels with Professor Boyan Vodenitcharov and she also receives lessons from Maestro Aquiles delle Vigne in Coimbra (Portugal).